ROGUE CHRISTIANITY - Faith off the Grid: UnChristian: Who Do I Emulate? UnChristian: Who Do I Emulate? I have been doing some thinking about the book UnChristian in which non – Christians had the opportunity to share their views of Evangelical Christians. Not surprisingly they are not too impressed by us. In fact the huge majority of them see us in a very negative light. 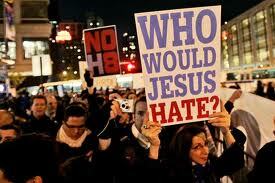 Specifically, they see us a being homo – phobic, pro – war, insensitive and extremely judgmental. When I read these accusations towards us I could not help but think of what would happen if we were able to go back in time and do a similar research project on people’s views of Jesus. What would the “sinners” in Jesus’ day say about him? I think that they would be very positive about Jesus after all they were always hanging around him (see Luke 15: 1 - 2). I believe that they would see him as being the opposite of how non – Christians view us Evangelicals today. They would see Jesus as being sympathetic and forgiving (not homo – phobic), merciful (not pro – war), empathetic (not insensitive) and very gracious (not judgmental).